Texas is currently ranked 15th in the United States for its economic outlook. This is a forward-looking forecast based on the state’s standing (equal-weighted average) in 15 important state policy variables. Data reflect state and local rates and revenues and any effect of federal deductibility. From the 2019 edition of Rich States, Poor States. These values are the most recent available at the time of publication. Estate / Inheritance Tax Levied? Each edition's rank is based on the most recent data available at the time of publication. The y-axis for these charts is the actual year of the data, rather than the year of the corresponding publication year. This ranking includes local taxes, if any, and any impact of federal deductibility, if allowed. A state’s largest city was used as a proxy for local tax rates. Data were drawn from Tax Analysts, Federation of Tax Administrators and individual state tax return forms. Tax rates are as of January 1, 2019. This variable includes local taxes, if any, and includes the effect of federal deductibility, if allowed. A state’s largest city was used as a proxy for local tax rates. In the case of gross receipts or business franchise taxes, an effective tax rate was approximated using NIPA profits, rental and proprietor’s income and gross domestic product data. The Texas franchise tax is not a traditional gross receipts tax, but is instead a “margin” tax with more than one rate. A margin tax creates less distortion than does a gross receipts tax. Therefore, what we believe is the best mea- surement for an effective corporate tax rate for Texas is to average the 4.4997 percent measure we would use if the tax was a gross receipts tax and the 0.75 percent highest rate on its margin tax, leading to our measure of 2.62 percent. Data were drawn from Tax Analysts, Federation of Tax Administrators, individual state tax return forms and the Bureau of Economic Analysis. Tax rates are as of January 1, 2019. This variable was measured as the difference between the average tax liability per $1,000 at incomes of $50,000 and $150,000. The tax liabilities were measured using a combination of effective tax rates, exemptions, and deductions at both state and federal levels, which are calculations from Laffer Associates. This variable was calculated by taking tax revenues from property taxes per $1,000 of personal income. We have used U.S. Census Bureau data, for which the most recent year available is 2016. These data were released in December 2018. This variable was calculated by taking tax revenues from sales taxes per $1,000 of personal income. Sales taxes taken into consideration include the general sales tax and specific sales taxes. We have used U.S. Census Bureau Data, for which the most recent year available is 2016. Where appropriate, gross receipts or business franchise taxes, counted as sales taxes in the Census data, were subtracted from a state’s total sales taxes in order to avoid double-counting tax burden in a state. These data were released in October 2018. This variable was calculated by taking tax revenues from all taxes—excluding personal income, corporate income (including corporate license), property, sales and severance per $1,000 of personal income. We used U.S. Census Bureau Data, for which the most recent year available is 2016. These data were released in October 2018. This variable calculates each state’s relative change in tax burden over a two-year period (in this case, the 2017 and 2018 legislative session) for the next fiscal year, using revenue estimates of legislated tax changes per $1,000 of personal income. This timeframe ensures that tax changes will still be reflected in a state’s ranking despite the lags in the tax revenue data. ALEC and Laffer Associates calculations used raw data from state legislative fiscal notes, state budget offices, state revenue offices and other sources, including the National Conference of State Legislators. Interest paid on debt as a percentage of total tax revenue. This information comes from 2016 U.S. Census Bureau data. These data were released in October 2018. This variable shows the full-time equivalent public employees per 10,000 of population. This information comes from 2016 U.S. Census Bureau data. These data were released in October 2018. This variable ranks tort systems by state. Information comes from the U.S. Chamber of Commerce Institute for Legal Reform 2017 Lawsuit Climate Survey. Minimum wage enforced on a state-by-state basis. If a state does not have a minimum wage, we use the federal minimum wage floor. This information comes from the U.S. Department of Labor, as of January 1, 2019. This variable highlights the 2018 Workers’ Compensation Index Rate (cost per $100 of payroll). This survey is conducted biennially by the Oregon Department of Consumer & Business Services, In- formation Management Division. States were ranked only by the number of state tax or expenditure limits in place. We measure this by i) a state expenditure limit, ii) mandatory voter approval of tax increases and iii) a supermajority requirement for tax increases. One point is awarded for each type of tax or expenditure limitation a state has. All tax or expenditure limitations measured apply directly to state government. This information comes from the Cato Institute and other sources. Years correspond to the year of the Rich States, Poor States publication, not the actual year of the data. In some cases the data is significantly behind the publication's year. Texas is currently ranked 2nd in the United States for its economic performance. This rank is a backward-looking measure based on the state’s performance (equal-weighted average) in three important performance variables shown below. These variables are highly influenced by state policy. 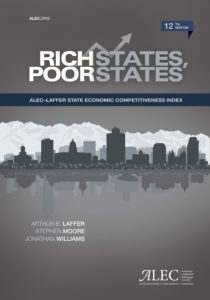 The Rich States, Poor States: ALEC-Laffer State Economic Competitiveness Index is a comprehensive report that ranks the economic competitiveness of states using 15 equally weighted policy variables. © 2019, all rights reserved. Rich States, Poor States is a project of the American Legislative Exchange Council.